What an amazing day!!! Nothing like anything I have ever done or seen before. The send off crowd was very energizing. Then the countless supporters along the way made the miles just melt away. 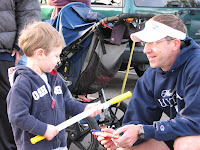 Before I knew it I was having a Michelob Ultra with everyone and the Running Center crew in Carlsbad. Just a quick recap. We started the day at 8:00 am with Jackson leading the way in the trusty stroller. Then Jen R. paced me along Nimitz out to Mission Bay. From Mission Bay, “Mustang” Sally entertained everyone along the route with her antics. I did avoid getting a tattoo with her in Ocean Beach. When we finally arrived at La Jolla, the Cures Rock! Tour party was in full swing. 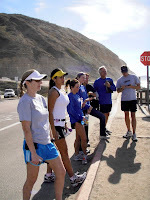 La Jolla saw the team of Jules and Mike crank out a bunch of miles. Jules is the original Cures Rock! Star. Then Aimee and I headed up the never ending La Jolla Shores hill, past Scripps (keep up the good fight) and then down to Torrey Pines Reserve. After a few interviews, Deborah “Ultra” help me make is safely to Moonlight Beach. Moonlight to the end I had the luxury of running with another Carlsbad local Michelle (and my buddy Max along Neptune….keep running hard)! Many thanks to all the media organizations helping to spread the word! The “Live Life to an Ultra” moment was the four family visits today in North County, San Diego. We met Grant Foster (3 ½ years old), Eva Istomin (12 years old), Red Riley Rapinan (5 years old) and Jason O’Hara (9 years old) and all of their families. The energy they received us with was overwhelming. They are our inspiration. After 35 miles, talking with these Cures Rock! Stars and their families and friends, the soreness and exhaustion was replaced by motivation and love. And the song of the Day 1 was I Gotta Feeling by the Black Eyed Peas. It was an obvious hit during all the New Year’s parties the pacers and support crew members were at before Day 1. And the O’Hara Family were rocking to it during our visit. So enjoy your night and enjoy your family! Pic #3: Tearing down Torrey Pines State Beach hill w/ Aimee S.
Wow.. awesome first day, Mike! All of us on the TNT team were thinking of you this morning as we did our 20 miler (but that's only the start of the day for you!). Have fun out there and bring home those cures! Way to go Mike!! Still praying for you my friend! So great! I did my second marathon in San Diego and my third in Phoenix but nothing like this. Go Mike and Jules! Can't wait to join up with the team tomorrow! Keep up the good work Mike! Thank you Mike, Julie, Bill, Heather, Mom Sheehy, and the entire Cures Rock Team! Grant had a wonderful time; you made his day :) Mike, we are all cheering for you here at the Fosters...Go hog wild! Below is a link to the video. What an amazing day it was and I am honored to have been apart of it. Thank you for allowing me to be one of your pacers for the day. I will forever remember Dill Pickle Hill!!! :-) Hugs to you and the crew for safety! Day 15: Welcome to Phoenix! What Would You Do to Cure Cancer? $400 for 400mi? Day 12: Why the Rush? Day 8: Mother Nature and Extreme Motocross! Day 7: Hey, This Looks Familiar! Day 5: Who Picked This Route? Cures Rock! goes "Hog Wild!" Day 3: Cures Rock! Tour - Hug a Tree, Please! Day 2: Ever Run To Work?….39 Miles!